Lei Garden CHIJMES: Daddy-Daughter Double Birthday Celebration! 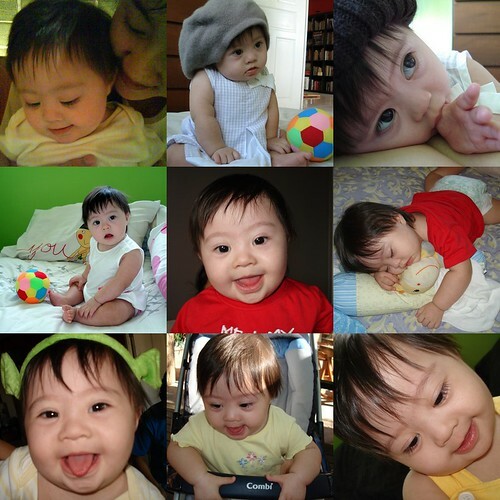 Nadine through her first year, originally uploaded by Camemberu. My baby girl Nadine is one year old today! She was born on her daddy's birthday, so both of them get to celebrate today (of course, no guessing whose birthday overshadows the other)! It's been a wonderful first year and her presence has filled the house with tremendous love and laughter. We wish more parents-to-be could be better informed about their choices when faced with the possibility of having a Down Syndrome baby - hospitals aren't very helpful, they just assume abortion is the way to go (one couple who also kept their baby, told us how the medical staff initiated the paperwork without even asking them first!). Sure, the journey is not easy but there are great resources, programs and support groups (even in Singapore!). And these kids will be the sweetest, most loving and sincere human beings you will ever know. Double-boiled soup - pork rib with salted vegetables, originally uploaded by Camemberu. We nearly went to check out Weiner Kaffeehaus but did a last minute detour to Lei Garden at CHIJMES, where we know we'll always get pretty good food. They had a set lunch for four (S$58) which suited us fine - a soup, dim sum, a fish dish, a meat dish, seasonal veges, and carbo of choice (fried rice or ee-fu noodles). 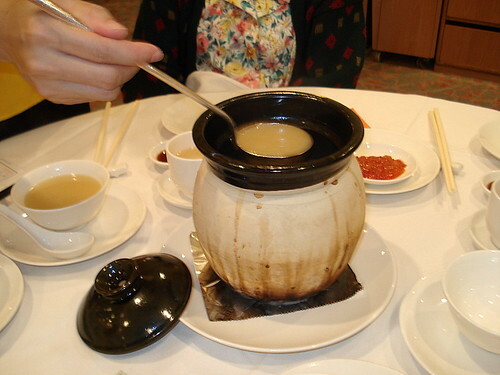 True to Cantonese tradition, it started with a double-boiled soup. Rich and opaque, it tasted quite unusual to me. We later found out (from ingredients at the bottom) that the soup was of pork ribs and salted vegetables. I wondered what else went into it. Hubby who normally HATES soup, drank three bowls! 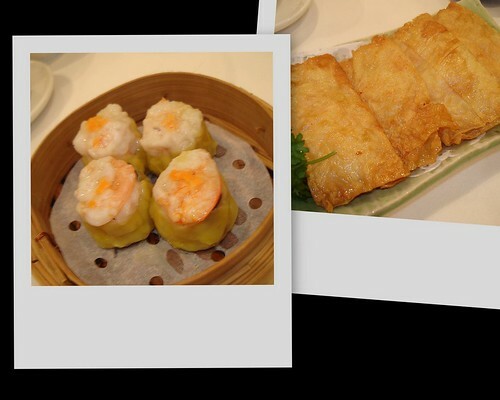 Dim Sum Combo - Siew Mai and Prawn Roll in Beancurd Skin, originally uploaded by Camemberu. The preset dim sum combination given was siew mai (hubby's favourite!) and pan-fried prawn roll in beancurd skin (my favourite!). Both OK, although I thought the siew mai looked a bit small (cos I just had enormous ones at Hua Ting). 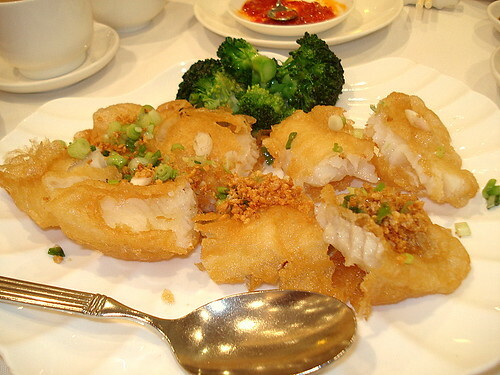 Fish Dish - Batter-fried Cod, originally uploaded by Camemberu. We all loved the cod crowned by garlic bits fried just right. It also came with a nice sauce. Nadine ate quite a bit of the fish (the insides of two pieces) and she normally doesn't like cod! 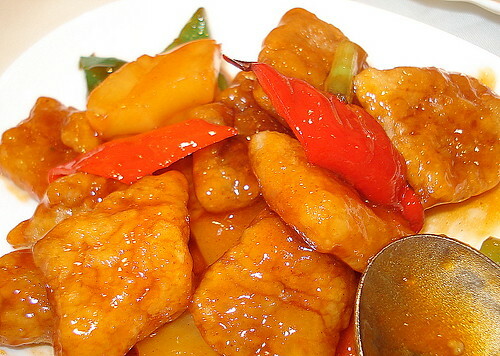 Sweet and Sour Pork with Pineapple, originally uploaded by Camemberu. Also nicely executed, the sweet and sour pork dish was crisp on the outside and tender on the inside. Sauce not too sweet or cloying. Chinese Spinach, originally uploaded by Camemberu. 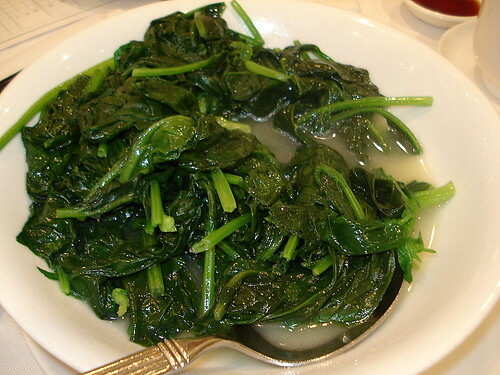 A very generous portion of Chinese spinach which we weren't able to finish. Teeny weeny bit bitter, as is normal of this vegetable. 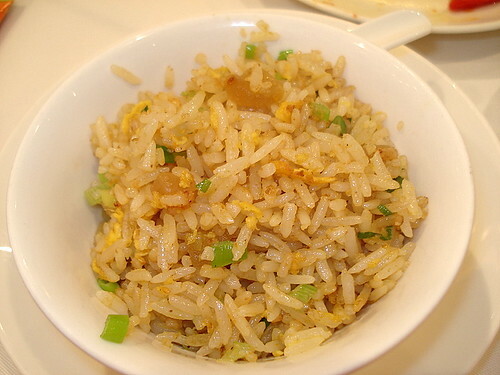 Fried Rice, originally uploaded by Camemberu. This is the first time I've tried fried rice that had bits of preserved lettuce in it - this added a really nice crunch to the dish. Just that and egg, spring onion, garlic and seasoning. So simple and yet so delicious. 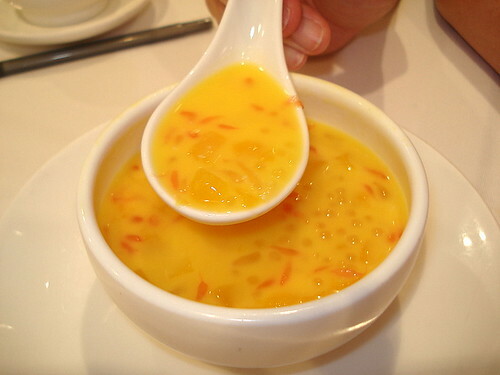 Chilled Mango Sago with Pomelo Sacs, originally uploaded by Camemberu. Although I saw that the menu included some "boiled Hawaiian papaya with snow fungus", the waitress clarified that dessert was not included in the set menu. No matter, we asked for some chilled mango sago with pomelo. Pleasant, refreshing and not too sweet. All in all, this was a good value meal! Service generally up to expectations and place is relatively child-friendly. And like in many other places, Nadine has got total strangers smiling, waving and cooing over her here too. Your baby girl is sooooo cute. Great story - I know little about DS and reading your blog has opened my mind up - a lot. I am proud of your choice as a fellow foodie. Thanks, Russ! That's very encouraging! I didn't know much about DS before either, but like many parents, I've found DS kids are a huge blessing regardless. Oh, the lunch set was $58 for four persons! Yeah, I know, sounds too cheap for Lei Garden! While I was there, I was also asking if it might be $58 per person! Hi Gen! Thanks for your lovely wishes! Let me know when you are back from New York! Hi! Always love reading your blog! So much better than other foodie blogs around and with a touch of 'heart'. I have worked with DS kids before and I must say they are really extremely loving and pure. Happy birthday to Nadine and she's really cute! Hi anonymous! Thank you for the biggest compliment ever - a touch of heart! Very happy that you have also come to know the joy of DS kids. Nadine waves back at ya! hi! I chanced upon your blog and this is the first entry i read. Of course i went on to read other food entries, and i'm so tempted to try the cherry garden weekend buffet, now! Hey... Nadine is beautiful... Happy Birthday to her, and your hubby, too! My son is 3.5, and he's autistic. He's only recently mastered the pincer grip. Raising up kids with special needs has its set of challenges, but in as much as we are trying to teach them many things, they are also in a special way, teaching us abt the most important things in life. Through my son, i realised that the most important things in life are not what i used to think them to be. Lets enjoy our journeys with our little ones. I wish your family many wonderful and beautiful miracles to come! 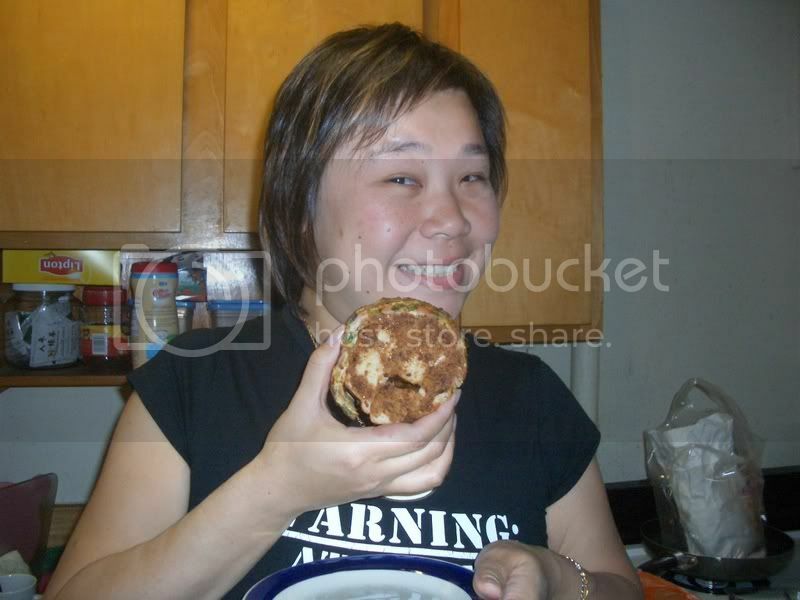 Btw, i think you and i share similar tastes in food! Hi Ade! Glad to meet another mom with a special kid! You are right about them teaching us many of life's most profound and significant insights. Congrats on your son's progress and may he have many more achievements! Every little thing counts! :) All the best to your family too! the set lunch $58 is for 4? thats quite reasonable given lei gardens standards. did u went back and try their main menu again after that? Brad, Lei Gardens never disappoints my family whenever we go. But we don't go very often because it is a bit pricey and quite famously so. The set meal was an unexpected find, actually. Haven't been back because I tend to want to try out new places. Yr little girl is so adorable! i concur with u tt Lei Gardens never disappoints. My girl had her 1YO bday celebration there too.